A high-efficiency furnace can pay for itself through energy savings. Need help with your furnace NOW? 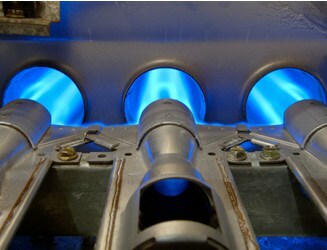 Get a Local Heating Pro Fast! What is the best forced-air furnace to buy? This expert, unbiased furnace buying guide will help you choose between the major brands to find the right heater for your home and budget. Is it time for you to buy a new high-efficiency forced-air furnace? Sky-high energy bills, diminishing resources, and environmental concerns have brought a great deal of attention to the topic of home energy efficiency in recent years—especially when it comes to heating. Homeowners are struggling to spend less, use less, and pollute less without giving up the warmth and comfort they’ve come to cherish. 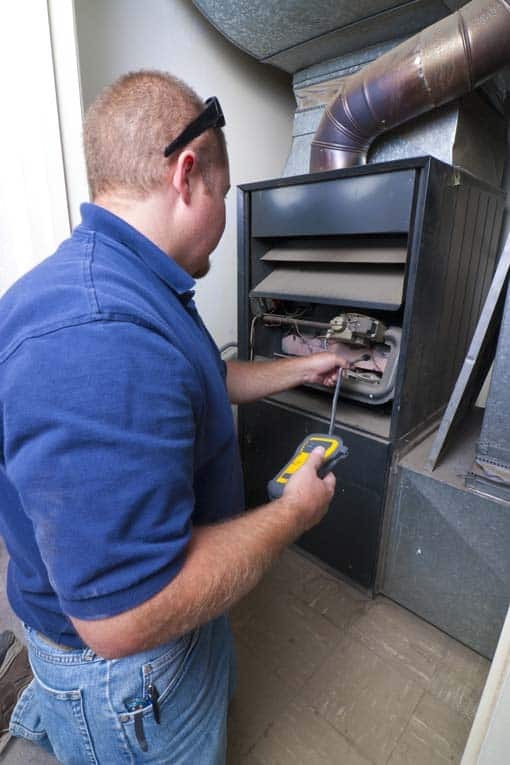 If your old furnace has stopped working entirely, it’s definitely time for a new, high-efficiency furnace. But, even if your old furnace seems to work okay, it might be time to consider replacing it with a more efficient model—to save money over the long run and enjoy more comfort and quiet now. The efficiency of your furnace can make a major difference in your energy bills. According to the U.S. Department of Energy (DOE), heating and cooling account for approximately 56 percent of the energy used in a typical U.S. home (the portion for heating is about 30 percent). Obviously, if you can squeeze more efficiency out of your heating and cooling equipment, you can make a major dent in your monthly energy bills. If you intend to stay in your home for a few years, upgrading from an old, inefficient furnace to a new, high-efficiency model can pay for itself and improve your comfort. If your furnace was installed before 1992, it is probably obsolete. In an effort to curb energy waste and pollution, the U.S. Department of Energy (DOE) instituted standards for manufacturers at the beginning of 1992 that required every new furnace to turn at least 78 percent of its fuel into heat. On May 1, 2013, these minimums rose to 80 percent. All new models sold must meet or surpass this; efficiencies climb as high as 98.5 percent with the best models. So, if your gas or oil-burning furnace was installed before 1992, you’re probably sending 30 percent or more of your energy dollars up the furnace flue, and, by the way, pumping up to 4 tons of carbon dioxide, the “greenhouse gas," into the atmosphere each year. In fact, if you have an older forced-air furnace operating at very low efficiencies, it probably produces about half the heat it could be providing on the same amount of fuel. If your furnace has a standing pilot light instead of electronic ignition, consider this to be another sign that it is an energy waster. Most furnaces sold in the United States are made by a handful of major manufacturers including Lennox, Trane, and Carrier (which also makes Day and Night and Bryant). In the following articles, we’ll help you sort through the brands, models, features, jargon, warranties, costs, and so forth to ease your decision-making. The biggest differences between the most expensive and least expensive models boil down to energy efficiency, comfort, and warranties. Now we’ll take a closer look at these factors. For information on determining the right size of furnace, see How to Size a Furnace. A furnace uses energy to produce and deliver heat. The more heat it can deliver with a given amount of energy, the better: This is the essence of “efficiency.” Furnace manufacturers strive to produce appliances that both burn fuel efficiently and require minimal energy (typically electricity) to run the blowers that circulate the heat to the house. Newly proposed EnergyGuide labels specify the states where an appliance can legally be installed. This furnace delivers over 98 percent efficiency. 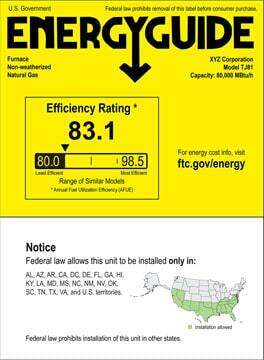 The measurement for furnace fuel efficiency is called an Annual Fuel Utilization Efficiency (AFUE) rating. All new furnaces are posted with this rating, generally in the form of a yellow “EnergyGuide" label that’s required by the Federal Trade Commission (FTC). Yellow EnergyGuide labels list estimated annual operating costs for furnaces under specific conditions; these are meant for comparison shopping only. Though most makers call their furnaces “high efficiency," the DOE only refers to units with an AFUE higher than 90 percent as “high efficiency" and models with an 80 percent to 83 percent AFUE as “mid efficiency." As minimums rise, these descriptions become even less meaningful. Just pay attention to the percentage. And be aware that, depending upon where you live, it may not be worth it to spend the big bucks for the highest efficiency unit available. Though these units usually make sense in cold climates, the savings might not pencil out if you live in a mild-winter climate. Future minimum AFUE requirements for furnaces will be even tighter, and they’ll be tailored to the type of fuel used and whether the unit is “weatherized" (built for outdoor installation) or “non-weatherized" (intended only for installation indoors). Furnaces designed specifically for use in a mobile home will have slightly lower minimums. 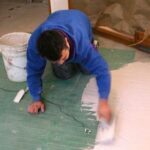 Where they are installed will also affect the regulations: All non-weatherized furnaces installed in the northern United States must have at least a 90 percent AFUE. An electric furnace or boiler doesn’t lose heat up its flue because it doesn’t have a flue. For this reason, it typically will have an AFUE in the 95 percent to 100 percent range. That’s great, however, the problem with an electric furnace is that electricity is a much more expensive fuel source than the fossil fuels, so an electric furnace rarely makes economic sense. If you want to rely on electricity as a fuel source for heating, a much better alternative is a heat pump (see the Heat Pumps Buying Guide). The combustion side of furnaces—the mixing of combustion air with fuel—is an area where technological advances have improved energy efficiency. High-efficiency furnaces keep close control over the amount of air mixed with gas and vary the speed of the blower motor depending upon the demands of the home. “Sealed combustion," which means bringing all combustion air from outdoors and mixing it with the fuel at a controlled rate, maximizes heat from the fuel. Gas burners blast into the heat exchanger, warming the furnace quickly. Gas valves have become more sophisticated, too. 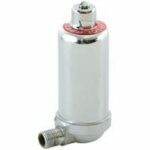 A two-stage gas valve warms up the furnace quickly and then drops back to a more economical flow. Many gas-fired, high-efficiency furnaces also save on the electricity required to power the blower motor, though this savings is not factored into the AFUE rating. They do this by coupling a sophisticated, programmable thermostat to a variable-speed motor. Unlike a conventional system—where the furnace goes on, blows hot air into the house at full force for a few minutes, and then shuts off—a variable-speed, or “variable-capacity," system runs the blower for longer periods at lower speeds. It provides quieter and more even and comfortable heat and doesn’t consume electricity unnecessarily. During the past few years, manufacturers have used several innovations to boost efficiency. One early advancement was the move from the standing pilot light, which burns gas even when the furnace is dormant, to electronic spark ignition, which fires the furnace on demand. The higher-efficiency models are called “condensing gas furnaces." They run exhaust gases through a second heat exchanger to extract and use available heat that’s otherwise exhausted. These models pull out nearly all of the heat, sending cool exhaust out and leaving behind condensed water. This condensate, 5 to 6 gallons per day, is drained or pumped away by a condensate pump connected to the appliance. A key feature to look for when buying a condensing gas furnace is a long-term warranty on the heat exchanger; the best types are built to resist the corrosive effects of moisture and chemical buildup for the life of the house. Because they extract so much heat from a furnace’s exhaust, one bonus of condensing furnaces is that they may be vented out through a wall with inexpensive PVC pipe, an important feature that saves money and the hassle of routing a flue up through the roof. Furnace models with the highest efficiency ratings, those with an AFUE greater than 90 percent, combine several advancements into one package. For example, the Lennox SLP98V, which has up to 98.2 percent AFUE, automatically adjusts the speed to match the heating requirements, captures maximum heat with a stainless-steel secondary heat exchanger, and can interact intelligently with a thermostat for optimal efficiency. 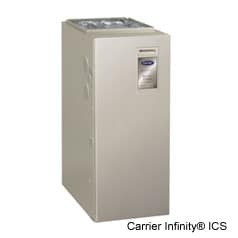 The Carrier Infinity ICS has up to a 95 percent AFUE; it has a condensing gas furnace with a microprocessor control board that automatically adjusts the furnace output and blower speed for optimum efficiency based on information from the thermostat. Both are high-quality products worthy of consideration. 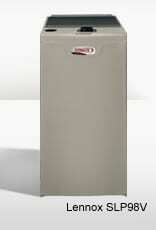 Buying a furnace isn’t like buying a new dishwasher. It is difficult to price competing brands online or in stores because 1) many furnaces are not sold online or through retailers (they are sold through HVAC dealers or wholesalers), and 2) prices normally don’t include installation. New furnaces are almost always installed by HVAC contractors, so the best way to figure out what a system is going to cost is to ask for free bids. You can get free estimates from this free online service: Find a Pre-Screened Local Furnace & Heating Pro. Circumstances will dictate the actual cost of replacing an old furnace with a new, high-efficiency model. 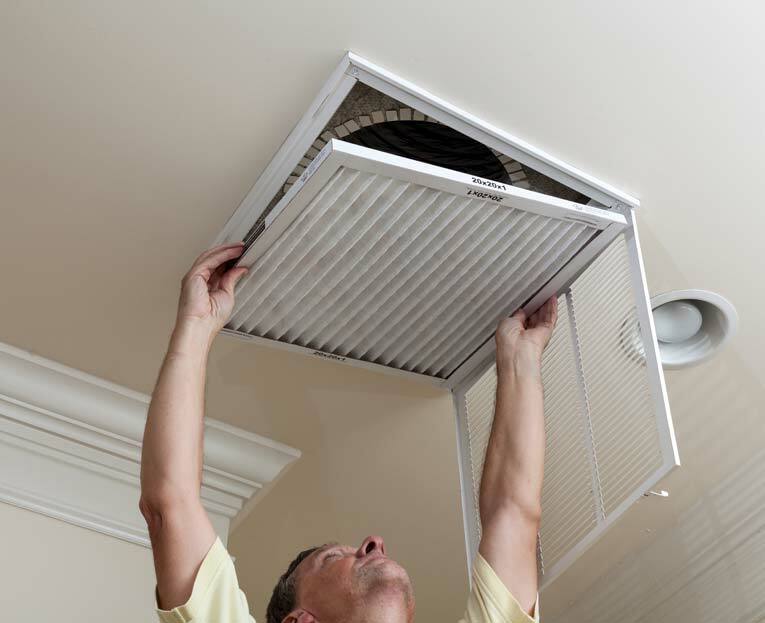 If the new unit can be connected to the existing duct work and exhaust flue, it may run from about $3,000 to $4,500, installed, depending on the equipment you choose. Of course, the higher the efficiency, the higher the cost of the unit. If you live in a mild climate, it may be overkill to get the most efficient model—the extra cost probably won’t be offset by energy bill savings (but the environment will love you). If you live in a cold-winter climate, it’s often wisest to buy the highest efficiency you can afford. When buying a system, you should ask your dealer to help you figure the payback in terms of energy savings.